Did you have a good year? Sometimes as we age memories seem very fleeting but there are always nice things to remember and that is why I choose to highlight some of the pleasant and important things that did happen with my family. Remembering those who are no longer with us still seems an appropriate way to start this account as I like to remember some of the reasons why we miss them. Peggy Martin, a regular New Years Eve guest for over a decade and the mother of a close friend, Barbara. A few things I remember include a love for her cottage and a bird watcher. She was remarkable in her joy of life. Up to the last she participated in a theatrical presentation. I remember exchanging a few nature videos with her. Don Theroux, our handyman, was recommended to me by a Home Hardware store owner who thought Don was the fairest one he knew. Don was involved with fundraising including some events for Gage Park that we attended. I learned that he also did fundraising for other causes. When our son, Michael needed to raise money for an African venture, Don was very supportive persuading us to hold one more dinner that helped put us over the top. Don did a lot of renovations around our house and simple things that I was too incompetent to handle without ever belittling me. He had been a customer of ours, mostly for items he would give to other people. I learned that he liked to buy from his customers. We were well aware of his battle with cancer and admired his courage and determination. Last year we lost one of our cats and a few months later the other one. Took some of the joy out of life and soon we got another and then felt it would be better to get a companion. Cats are individuals and with different timing you can get different results. Our two new cats came to us within a few months of one another and they play with each other much more than the previous two. Surprising the younger, smaller male cat is the alpha, but the two love playing together and the older female is protective of her new playmate. Last Christmas our daughter Heather bought us Netflix, our son Michael visiting from New Zealand bought us a large flat screen. Fortunately for us they helped set everything up. We both became addicted to watching Breaking Bad, Suits, The Good Wife, House of Cards, the Killing, The Bridge, Scott and Bailey, etc. In past years we have enjoyed the Mum show and this year we checked out Spring tide at Gage Park and enjoyed it. The Can-Am Equine show in Orangeville was more interesting than usual. With the help of Glenda Fordham we added an artist and three authors to our booth. We were also situated right beside a booth with the headliner, Guy McLean. As a fellow Aussie, Glenda was able to lure him over to our booth for one of my favorite photos of the year. with Barry and Bruce K Lawes, an amazing artist. We got a last minute change of plans when Heather called to give us an early Mother's Day and Father's Day present with a Pop Up dinner. A local business organized six wineries and six chefs for a very special dinner held at Liuna Station. Very enjoyable. Heather had won tickets and sat at another table, but our table consisted of reps for two wineries plus from Cake and Loaf (a fantastic bakery) for some interesting conversation. Doors Open Hamilton was enjoyable. Each year I try to see a few new buildings. This year, mainly because the Dundurn Castle parking lot was over flowing I visited the Hamilton Cemetery and it was well worth it. I also visited the Empire Building. The Burlington Eagles Gift of Giving Back food drive set a new record 278,550.01 pounds. It is important to realize their success is not just the enthusiasm of a sports group, but the ability to organize other groups to get involved. For that I credit Jean Longfield who has developed a lot of support from different parts of Burlington. Supercrawl is getting bigger and better each year. This year they tacked on an extra day. Lots of restaurants and food trucks. One of the highlights was Circus Orange that like to play with fire and high elevation. Right after I took part in the Parkinson's Superwalk and this year raised a little more than usual. Walking through Gage Park is always a pleasure. The Mum show in November had theme of the upcoming Pan American Games. The soccer games will be played in Hamilton and I hope to take in some of the action. As usual the flower display was dazzling. We attended two 40th wedding anniversaries. Michael and Karen Bromilow and John and Debbie Polkinghorne. John and Debbie's was at their cottage near Parry Sound. Both were great fun, meeting old friends, their offspring and in some cases pets. Took in one movie at the Art Gallery of Hamilton International Filmfest. Film festivals are used to help book "art" films or point towards awards. Juliet Binoche is one of my favourites and she starred in the last night's presentation of "1,000 Times Good Night" which we found enjoyable. A highlight for me was meeting up with my sister Rebecca, this time with her husband Ali and daughter, Samia along with my brother Marshall and his wife Jean. We met at The Old Spaghetti Factory in Toronto and did some shopping at the St Lawrence Market during the holidays..
We like to close out the year with a few close friends at our place for food, drinks and laughs. I consider eating out one of the beautiful things in life and so consider restaurants as an art form. Culantro Peruvian was my choice for my birthday. Stone House (for our actual 40th anniversary), Sokratis for a family function, Earth to Table, Jack and Lois, Ben Thanh Viet Thai, Nonna's. Ventura's tried during Supercrawl and were very pleased with the service on a very busy day. Bruyere in Cornwall gave a special private dinner. on the occasion of my aunt's memorial. I did a lot of blogging. The top three that drew attention were: "Overbooked", about a travel book at http://www.therealjohndavidson.com/2014/03/glenn-ford-forgotten-movie-star-from.html Glenn Ford, an admired old time movie star at http://www.therealjohndavidson.com/2014/03/glenn-ford-forgotten-movie-star-from.htmlnd my short but educational political career at http://www.therealjohndavidson.com/2014/04/my-short-but-educational-political.html Enjoyed reading the few comments. Without an audience there is not the motivation to write. This year we will create some more memories. 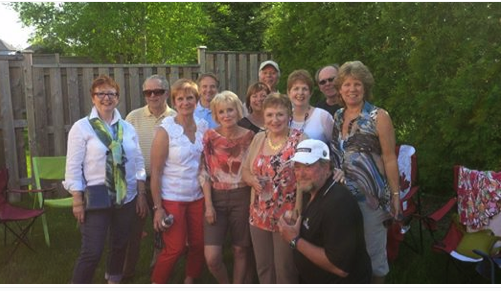 Photos: A group including me who have known each other for over 40 years and some for over 50 years getting together at the anniversary of Michael and Karen Bromilow. Oscar and Izzy meeting Lexie. Barry Finn, publisher of the Rider with headliner Guy McLean and fantastic artist Bruce K Lawes. The tombstone of George Hamilton, founder of Hamilton. His grave had been moved to the Hamilton Cemetery which had been used for military fortifications during the War of 1812. The round ball was done by a fellow mason to symbolize a requirement of being a mason. One of the aerialists performing with Circus Orange. Flowers at the Mum Show. Marshall, Jean, Rebecca, Ali, Samia and Sharon at the St Lawrence Market. Karen, Susan and Debbie enjoying New Years' Eve at our place.